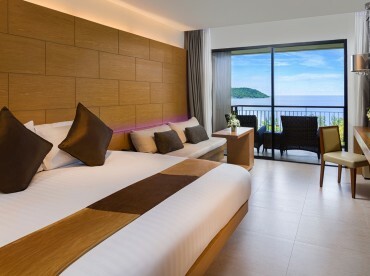 Perfect for groups or families, Novotel Phuket Kata Avista’s special set of Superior Rooms with two Double Beds offers an excellent value and an ideal way for several holidaymakers to enjoy their time together away from home. With a balcony for relaxation, room service for convenience and a TV, DVD player, microwave, pantry and free Wi-Fi for indoor entertainment, each one of the Kata beach hotel’s 45 Superior Rooms with 2 Double Beds provides a social atmosphere in a purely comfortable setting. Families and friends can also go out and enjoy Thai cooking classes, a game room, kids’ club, beaches and tours around the island – activities to satisfy any group of travelers.